Kick off your visit on the 2nd (Sat): stop by Your Piece Of Finland, take an in-depth tour of Arktikum, then make a trip to Santa Claus Office, then take an exotic tour of a safari tour, and finally make a trip to Marttiinin Wanha Tehdas. To find maps, ratings, photos, and other tourist information, refer to the Rovaniemi online trip itinerary builder . Helsinki to Rovaniemi is an approximately 4-hour flight. You can also do a combination of flight and train; or drive. Prepare for a bit cooler weather when traveling from Helsinki in March: high temperatures in Rovaniemi hover around -1°C and lows are around -9°C. Finish up your sightseeing early on the 2nd (Sat) so you can travel to Muonio. Muonio is a municipality of Finland.The town is located in far northern Finland above the Arctic Circle on the country's western border, within the area of the former Lappi province. 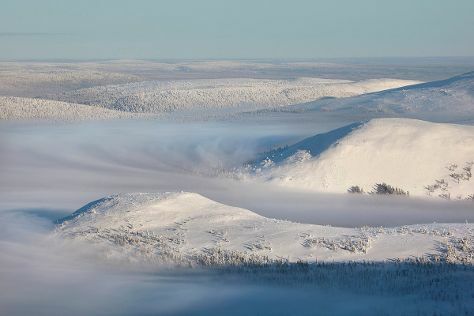 Start off your visit on the 3rd (Sun): glide through natural beauty at Pallas-Yllastunturi National Park. For more things to do, where to stay, ratings, and more tourist information, refer to the Muonio road trip planning tool . You can drive from Rovaniemi to Muonio in 3 hours. In March in Muonio, expect temperatures between -1°C during the day and -12°C at night. Finish up your sightseeing early on the 3rd (Sun) so you can travel to Helsinki. Start off your visit on the 4th (Mon): admire the striking features of Rock Church, pause for some serene contemplation at Helsinki Cathedral, then brush up on your military savvy at Sea Fortress Suomenlinna, and finally stroll through Aurinkolahti Beach. Get ready for a full day of sightseeing on the next day: take in the spiritual surroundings of Uspenskin Cathedral (Uspenskin Katedraali), wander the streets of Ullanlinna, then get engrossed in the history at Seurasaari Island and Open-Air Museum, and finally stroll through Hietaranta Beach. To find more things to do, traveler tips, ratings, and more tourist information, go to the Helsinki trip planner. Use the Route module to find suitable travel options from Muonio to Helsinki. Plan for somewhat warmer temperatures traveling from Muonio in March, with highs in Helsinki at 3°C and lows at -5°C. Finish your sightseeing early on the 5th (Tue) so you can travel back home. On the 6th (Wed), surround yourself with nature on a nature and wildlife tour and then see the interesting displays at Siida. 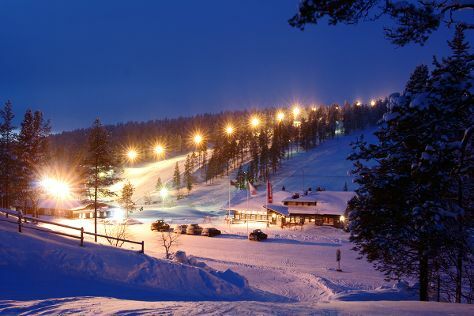 Keep things going the next day: hit the slopes at Saariselka Ski & Sport Resort. To see photos, reviews, maps, and tourist information, go to the Saariselka holiday tool . You can do a combination of flight and bus from Helsinki to Saariselka in 4.5 hours. Other options are to do a combination of train and bus; or drive. Expect little chillier temperatures when traveling from Helsinki in March; daily highs in Saariselka reach -1°C and lows reach -12°C. Wrap up your sightseeing by early afternoon on the 8th (Fri) to allow time for travel back home.